When it comes to maximizing your outdoor protection from the elements, don't forget the vehicles. Your cars, trucks, boats, or whatever else you drive are just as susceptible to damage from rust, UV rays, and flying debris as you are. That's why this Caravan Domain Carport Sidewall Enclosure Kit is such a great product. This kit allows you to take your existing Domain 10 x 20 carport and convert it into the totally enclosed, totally protected structure you're looking for. This kit consists of a solid back wall panel, two solid side panels, and a front panel with dual zippers and a roll-up door. Each panel attaches easily to the 10 x 20 Domain Carport frame to create a secure, protective connection that effectively encloses the carport from top to bottom and from side to side. Entry and exit is easy thanks to the zippered front and roll up door, storing your vehicles becomes a much more practical long-term proposition, and getting a Domain carport with an enclosure kit is much, much cheaper than constructing a permanent carport to house your vehicles. 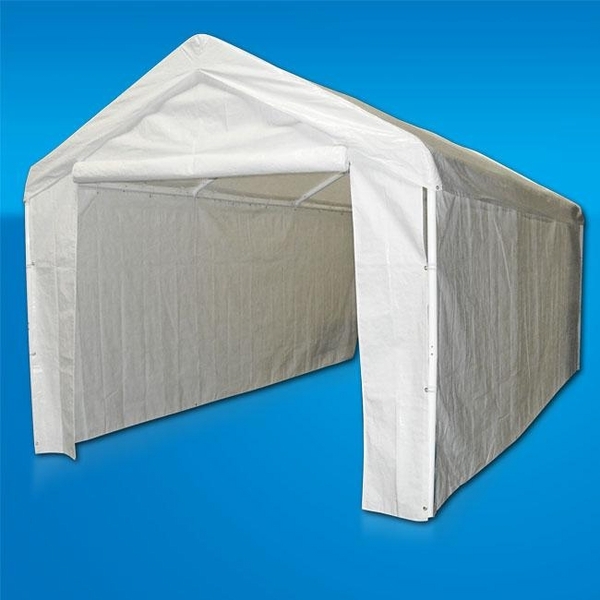 The durable 130g polyethylene construction also ensures that your valuable equipment gets maximum protection from wind, rain, airborne debris, and damaging UV rays. There are plenty of things you can't control about your favorite vehicles and certainly about how the weather behaves. What you can control to a large extent is how that weather affects your belongings. To maximize the protection for your favorite belongings and to minimize the strain on your budget, the Caravan Domain Carport Sidewall Enclosure Kit is an affordable and practical option. WARNING: This product can expose you to chemicals including Diethylhexyl Phthalate, which is known to the State of California to cause cancer, birth defects, or other reproductive harm. For more information go to www.P65Warnings.ca.gov.